One stereotype of the older person is that they sometimes appear simple-minded, forget things, and/or tend to repeat themselves. Actually, this might not be a stereotype. I have noticed I tend to drift back to the same stories from time to time, although hopefully, each retelling is at least slightly different from the last.This morning, I went through my old blogs looking for duplicative pieces and orphan photos, and found that while I might cover a story more than once, I cover it differently each time. This happens because I cannot remember what I said the last time I told the story. Actually, no one can tell a story the same way twice. This is how the police know you are lying if you tell a made up story. Made up stories are prearranged and memorized (let’s get our story straight), and this is a dead giveaway to the attentive cop. You can tell I don’t make things up because I leave out items every time I tell the story. Got that? Old people also read mystery stories. That’s how they know about these things. The beauty of being forgetful is that you can see the same TV program or read the same book over and over and pick up new or new-to-you details each time. We also laugh at the same jokes over and over. “I have never noticed that before,” is a frequent refrain around our house. Telling true stories from the past or staying in the present moment, I am less likely to sound repetitive. However some things I do every day might seem slightly repetitive. Some seniors like routine. David and I like our routine. We find routines comforting. No more thrills, chills and spills for me, I hope. My dogs feel the same way. For example, David and I like to watch birds. We are very nearly bird fanatics. We even like to watch and re watch seniors watching birds on Maryland Public Television. We have several feeders and bird baths around our property and I have ordered new Wren houses because Wrens are voracious insect eaters and help protect my garden. I saw a Carolina Wren inspecting the bird house I can see from my kitchen window and noted that she was too fat to squeeze through the Wren sized hole. She is probably about to lay eggs. 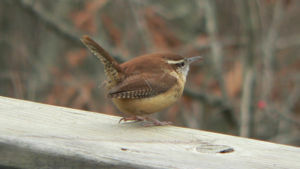 As I had ordered three “House Wren” sized houses, I asked David, who is always looking for reason to use his woodworking tools, to enlarge the hole in the one near the kitchen to Carolina Wren size. Yesterday, David finally saw the White-Breasted Nuthatch creeping down the Walnut tree toward one of the bird feeders. When I first noticed her, she was inspecting the bird house that hangs on a post near the bird feeder. Nuthatches like the grocery store handy. What a thrill for David to see the Nuthatch. “Wow, look at her long beak,” he said. He only began to notice the birds a few years ago when Aunt Marge visited us one spring. 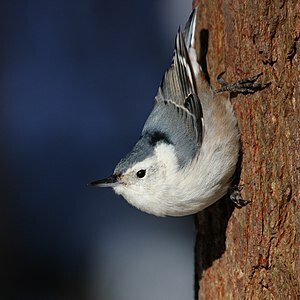 I keep a lifetime record of my bird sightings, so I know when I saw my first White Breasted Nuthatch (1990). I often record where I saw the bird, but in this case I did not. This means I probably saw it in my back yard. It was probably the ancestor of the little female who is inspecting our yard for housing. I inherited my love of bird watching from my parents and grandparents. My mother’s mother (Nana) and I spent many hours watching birds. In the photo above, we are in Brook Green Gardens looking at birds in South Carolina in 1947. I’ve shown this photo before, and I really love it. This is one of the few photos I have of Nana. Nana also raised pet birds. She used to take them out of their cages and kiss them goodnight. I have noticed that many people have acquired an interest in bird watching in recent years. This is a good thing as people who are “into” birds are sensitized to environmental issues such as development in watershed areas and water pollution problems. Birders also know deer are bad because they are destroying many bird habitats. ElderHostel (now Road Scholar) offers trips to various places to watch birds. After I finish school, I hope to travel to Cape May New Jersey to observe the spring or fall migration. Cape May lies on the Eastern Flyway, and is one of the best bird sites in the United States. I’ve been to Cape May many times bit always in summer. I was signed up for a trip there one spring, but never made it. Thus, I have never been there during the migration season. I suppose I will have to add it to my bucket list or something. In the meantime, I can sit in my backyard, which sits right on the Eastern Flyway and bird spot. 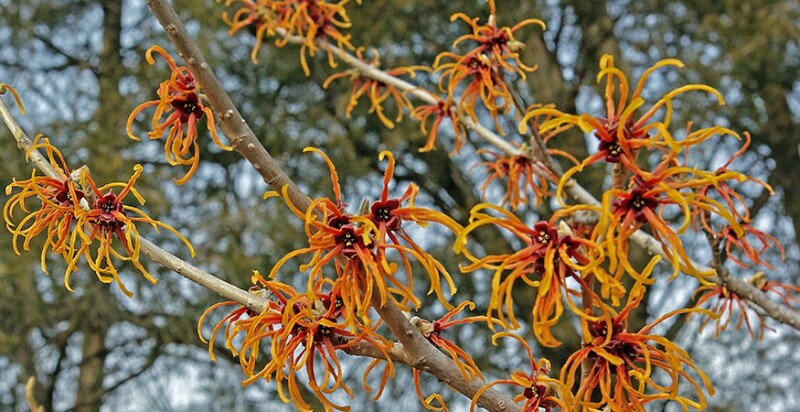 This entry was posted in Birds, Elder Blogger, Family/Children, Memories, Retirement Living by SchmidleysScribblins. Bookmark the permalink. That photo with your grandmother just makes my heart glow. Oh thnks Al. It makes my heart glow too because she was swell and I was adorable. Birding is a great activity. Our camera just died, and we’re researching others. You post excellent photos. Any recommendation on what to buy? It is clear that you and David are into backyard birding the same way you are with your other interests, with curiosity, appreciation and creativity in full force. Enjoy! And the photo of you and Nana is priceless. Good luck with seeing the migration. Lots to do when you are retired. I love that photo of the two of you too. You can see such love there. I’ve always enjoyed watching birds, even the mynahs and bulbuls who drive us nuts eating our fruit. I didn’t know that about the police and lying. I have such a poor memory, I keep forgetting what I’ve already blogged about. You should do well with the police. Just look blank and say you can’t remember a thing. Such a sweet picture of you and your Nana. I try to bird watch but I have just an awful time ID’ing them. I am poor with detail. Thank you for your kind words in your comment and please tell David I understand his pain. It really hurts. Oh I loved my Nana. Mom said her name was Frances, but years later doing geneological work I discovered her birth name was Franje. She was Dutch of course. Living in Maryland years ago, I learned of the regional Bluebird Society from a a woman sitting next to me on a plane. Eager to put a little birdhouse in our backyard until a neighbor, always unhappy about our two cats’ visits to her yard, suggested otherwise. Then there’s “The Bluebird of Happiness” and the power of Shirley Temple memories for those of us of a certain age. From my windows here on the other coast, fewer birds up close yet always the crows!